The story of Combat Outpost Keating is perhaps one of the most tragic of the Afghanistan war. The U.S. camp was located in a remote area of Afghanistan, near the Pakistan border, at the base of three mountains — a nearly indefensible position — defend the position, at great expense by U.S. forces, for over three years. In October 2009, Taliban forces attacked Outpost Keating. U.S. troops, outnumbered seven to one, defended the post, but sustained heavy casualties. Of 53, 8 died and 22 were wounded, making the battle one of the deadliest for U.S. forces in the Afghanistan war. Combat Outpost Keating is the subject of ABC White House correspondent Jake Tapper’s recent book, The Outpost: An Untold Story of American Valor. Tapper recently discussed the book on The Colbert Report. The real tragedy, he said, is that “Despite some successes in three and a half years of the camp, by the end its only purpose really was its own self-defense.” American forces withdrew from Combat Outpost Keating shortly after that deadly battle in 2009; the war continued. A Pentagon investigation later concluded there was “no strategic purpose” for the camp. Outpost Keating was the direct result of the flawed U.S. strategy in Afghanistan. In fact, The way the U.S. has carried out the war may have created more problems than it solved. Take the surge strategy for example. In late 2009 the administration announced a plan to send an additional 33,000 troops to support the 68,000 already stationed in Afghanistan. Over the next several years U.S. troop levels increased, then the additional forces were gradually withdrawn. The last of the surge troop left Afghanistan two months ago, bringing us back to the 2009 level. The Afghanistan surge was supposed to help eliminate and suppress the insurgency. Instead, the opposite happened. From 2009 to 2012, the number of enemy initiated attacks increased, according to the military’s own figures. The limits of a strategy that relies too much on troop levels has been clear to the American public for some time. Opinion polls show support for the at all-time lows. According to a recent Washington Post/ABC poll, 66 percent think the costs of the war in Afghanistan outweigh the benefits. 60 percent of respondents support withdrawing troops as soon as possible, according to an October Pew poll. Some members of Congress are starting to catch up to the public. Former supporters of the war have come out in favor of ending it. Last week 62 Senators voted in support of an accelerated drawdown. Of course, there are still some holdouts, some who refuse to see that ten years, $500 billion, and little progress adds up to a bad strategy. A recent op-ed called for keeping 30,000 troops in Afghanistan after 2014. Maintaining a military presence of that size would likely cost over $30 billion per year, based on expert estimates. With a national debt of over $16 trillion, the U.S. can’t afford to continue a war most Americans don’t support. Instead of spending billions in Afghanistan, we should be focusing on building the U.S. economy. $30 billion would go a long way towards repairing decaying infrastructure or rebuilding after Hurricane Sandy. Better yet, instead of prolonging the war, maybe we should be investing in programs to care for the veterans who served in places like Outpost Camp Keating. A week after Hurricane Sandy hit the East Coast, many are struggling to cope with the devastation left behind. In New York, freezing temperatures and fuel shortages combined to create a housing crisis leaving devastation in its wake. Some 1.4 million homes and businesses are still without power. In fact, for the past three years the annual costs of the war in Afghanistan have been more than double the estimated cost of Sandy, $107 billion in 2010, $122 billion in 2011, and $111 billion in 2012. Only Hurricane Katrina, the most expensive storm on record at over $100 billion, comes close to the costs of one year of war in Afghanistan. from 1900 to 2010 totals $283 billion – about $300 billion less than the amount the U.S. has spent in Afghanistan since 2001. Unfortunately, the $580 billion invested in the war effort hasn’t seen a national security return. Over the past three years an additional 30,000 U.S. troops were sent to Afghanistan – yet the number of insurgent attacks is higher today than it was in 2009. The U.S. has allocated over $50 billion to train and equip the Afghan security forces, yet no Afghan Army unit can operate independently and accusations of corruption and abuse in the Afghan police force are widespread. Billions more have been spent on construction projects that Afghanistan’s economy will not be able to sustain. As Hurricane Sandy has made all too clear, taxpayer dollars would be better spent on rebuilding U.S. cities than on wasteful projects in Afghanistan. Note: This is the second in a three-part series on the economic costs of the war in Afghanistan. Part one can be found here. Part three is forthcoming. After eleven years of war in Afghanistan, the U.S. is planning to withdraw its combat troops by the end of 2014 — two years from now. But even after combat operations end, the U.S. policy towards Afghanistan war will continue to cost taxpayers billions each year. Afghanistan has become the forgotten war. It has been largely ignored by both presidential candidates. If you listened only to what policymakers are saying about Afghanistan, you might think the war was already over. But 68,000 U.S. troops are stationed in Afghanistan today. To sustain the war effort in 2013, the Pentagon has requested over $80 billion. War costs will decline by a lot or a little in 2014 depending on the pace of the drawdown. Still, going by the trend for the past decades of wars, we can expect costs for the next two years to push the total cost of the war in Afghanistan close to $700 billion. But the costs of U.S. operations in Afghanistan won’t end in 2014. While the U.S. maintains that it will not seek permanent military bases in Afghanistan, some policymakers have called for leaving a sizeable military force – up to 20,000 troops – in Afghanistan after 2014. Experts estimate that maintaining military presence on this scale could cost $25 billion per year. In addition to the possibility of supporting a continued U.S. military presence, the U.S. will likely continue to spend billions on Afghanistan aid each year. Congress has allocated $50 billion in security aid to Afghanistan over the past 10 years. U.S. officials have said its future contribution for Afghan security aid will be around $2 billion per year. The Afghan security forces will likely be dependent on foreign donors for quite some time, as the International Monetary Fund estimates that Afghanistan’s economy will not be able to sustain the country’s security operations until 2023. In addition to the ongoing costs of operations in Afghanistan, the war has led to indirect costs that will continue for decades. Studies show that caring for the veterans of Iraq and Afghanistan could cost $600 billion to $1 trillion over the next forty years. The financial cost of Afghanistan war have already taken a toll on the U.S. economy, and it will continue to do so unless we realign our Afghanistan strategy with U.S. national security interests. 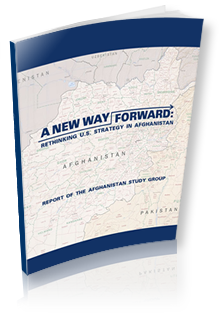 A reevaluation of the U.S. policy towards Afghanistan will save billions and support a more effective national security strategy. Washington Post editor Jackson Diehl’s op-ed “Obama and Romney are ignoring the Afghanistan war” made quite a splash. The candidates silence on the Afghanistan war shows how out of touch they and other policymakers are with the American public. Americans have strong opinions on Afghanistan, and the latest polls show it. According to a July poll by the Chicago Council on Global Affairs, two-thirds of Americans believe the war in Afghanistan has not been worth the costs. Support for the war has declined steadily over the past several years. Five years ago, over half of poll respondents said the war has been worth fighting, compared to only one in three this year. The belief that the costs of the war outweigh the benefits is stronger among Democrats and Independents, but a majority of Republicans (58%) agree, according to the Chicago Council poll. There’s more behind the decline in public support than war-weariness. Americans aren’t tired simply because the war has been long; they’re tired of spending billions of dollars on a war that no longer advances vital U.S. security interests. Increasing the federal debt has an effect on every American. Take interest rates, for example. According to Brown University and the Watson Institute’s’ Costs of War Project, the average homebuyer had to make $600 more in mortgage payments because war borrowing has driven up interest rates. This year, every week of war in Afghanistan costs American taxpayers $2 billion. War costs are going down, but not fast enough. Policymakers should take their cue from the public and work to end wasteful war spending. While there are still a lot of unanswered questions about what the U.S. presence to Afghanistan will look like after 2014, the U.S. took a step towards clarifying its commitment this week by designating Afghanistan a major non-NATO ally. International donors also committed to $16 billion in development aid to Afghanistan over the next four years at the international aid conference in Tokyo this Sunday. Both announcements ensure that the U.S. will be sending billions of taxpayer dollars to Afghanistan even as troop levels go down. And the drawdown itself will come at a high price. According to Pentagon officials, moving U.S. troops and equipment out of Afghanistan will cost billions of dollars, on top of more than $500 billion already spent on the Afghanistan war. The U.S. seems to be making a feeble attempt – very feeble; only in Afghanistan could $16 billion over four years be considered a cut – to stem the flow of aid dollars to Afghanistan. But what’s missing is an attempt to improve accountability in Afghanistan aid. Moving the mountain of U.S. military gear out of Afghanistan after more than a decade of war will cost billions of dollars and prove far more difficult than last year’s withdrawal from Iraq. The Defense Department has decided to siphon off $1 billion from Pentagon accounts dedicated to building up Afghanistan’s national security forces and shift those dollars to other military priorities. Here’s part of the reason we’re spending so much money in Afghanistan. Just take a look at some of the pieces of a solicitation seeking a Swiss-Army-Knife complex to house a Ministry of Interior Supply Point, Fire Department, and Uniformed Police District Headquarters, in Nimroz province in the southwestern corner of the country. Why should we continue to provide billions of dollars to a regime and country where corruption is not just a problem but an integral part of the governing system?